I have Larry Sitsky’s two new pieces now, both sounding very exciting. One is for the 23 string Thom harp so I can play it outside. I have also learnt that I will be playing for the ceremony for the interment of the ashes of Philip and Nell Law at the Mawson station, which is a great honour. Preparations! At the moment we are trying to line up the right electronic equipment. 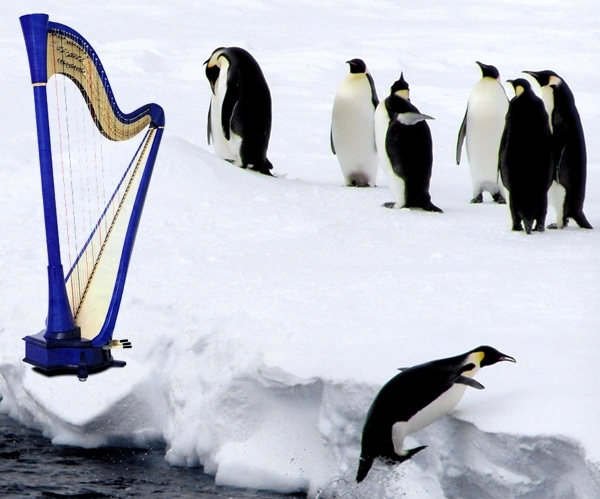 I’ll be taking video, camera and audio footage, as well as the equipment for the electro-acoustic harp, and need to be sure I have back-ups if anything fails in the cold weather. The experts at the ANU tell me that these things don’t really function well under 5%C, which makes me a bit nervous. Josh is teaching me how to use all the equipment – I’ll have to be my own film crew. I am about to pick up a little Andrew Thom lever harp from the Harp Centre, so that I have something I can take on board the ship with me to practice on during the voyage. The girls at the centre call it “Muddy Waters” because it’s blue, just like my Camac electro-acoustic harp. I’m used to my pedal harp so want to have some time to practice using the levers beforehand. Today I learnt a little piece “La Cinquantaine” by Gabriel Marie which my grandfather mentions hearing played on a harp on the gramaphone in the hut – he used it as wake up music when he was on all night watch and breakfast duty.